When your endearing child becomes an abrasive adolescent, the hard half of parenting begins. Now there is more conflict as your young person pushes against, pulls away from, and gets around parental authority for more freedom to grow. As a psychologist, I provide practical strategies in my articles and books to help parents effectively cope with this developmental change as well as with other normal child raising problems. Parents and Adolescents, giving public talks, writing books. MEMBER: The American Psychological Association, The Author's Guild. For complete list of my books, see "BOOK LIST" page on this website. Second 5 pages of website present my GRAPHICS. Order from any online bookseller. "We have been so happy to work within the framework of your book, 'Why Good Kids Act Cruel,' and the concepts of social cruelty as we have designed and piloted a curriculum for middle school students...and will expand for elementary and high school lessons." Dr. Mary Lee Webeck, Director of Education, Cynthia Lynn Capers, Associate Director of Education. "A must-read for any parent frustrated or heartbroken over their child’s difficulties striking out on their own." Understanding the challenges of the last stage of adolescence, Trial Independendence (ages 18 - 23), and how parents can help. Trade review from KIRKUS REVIEWS: "Parenting expert and therapist Pickhardt (Why Good Kids Act Cruel: The Hidden Truth About the Pre-Teen Years, 2010, etc.) tackles the issue of recently graduated students failing in the “real world” and provides suggestions on how concerned parents can help. The author, who writes the parenting blog “Surviving (Your Child’s) Adolescence” for Psychology Today, begins by defining the concept of adolescence in all its stages before investigating the concept of delayed maturity (what he terms "trial independence") and what that means for your child. Pickhardt offers a practical guide for understanding and supporting early adults as individuals while still respecting their nascent freedom. Children who fail on their own often find themselves returning to their original state—back under their parents’ roof. The author candidly discusses how parenting styles must evolve to create sustainable relationships as children first enter adulthood. 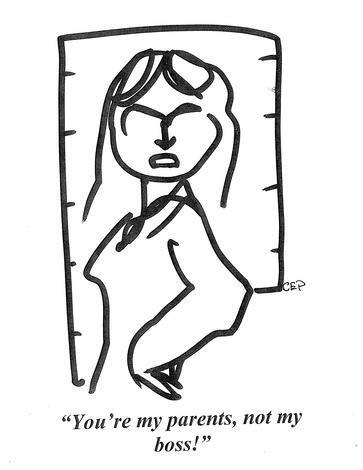 Each chapter provides fictitious examples of a challenge a late-stage adolescent will face while entering into a living and working situation that is entirely self-supported. The strength of the book is its thoroughness—the author draws from his experiences counseling parents and children alike in order to provide realistic solutions to problems both will face during this transitional period. A must-read for any parent frustrated or heartbroken over their child’s difficulties striking out on their own." Within modern society, high school graduation has come to symbolize the passage into adulthood. As graduates’ tassles are shifted from one side of their caps to the other, they assume a more autonomous status and accept a heightened responsibility. But are they ready? In his latest book, Boomerang Kids, Carl Pickhardt, Ed.M.’66, argues that a single ceremony is hardly all it takes to complete a transition to adulthood and fully develop the skills needed for independent living. 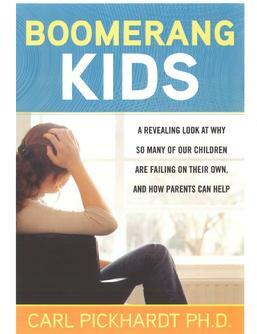 He claims that young adults aged 18 to 23 are actually in a final stage of adolescence, which he calls “trial independence.” However, because this delicate stage is often overlooked, Pickhardt asserts that adolescents face a premature thrust into adulthood, which has consequently led to a rise in “boomerang kids” — graduates who falter on their own and return home to rely on their parents’ support while they regain their footing. In an attempt to help parents understand this increasing phenomenon, Pickhardt approaches the problem from two angles, analyzing frequent causes as well as potential solutions. 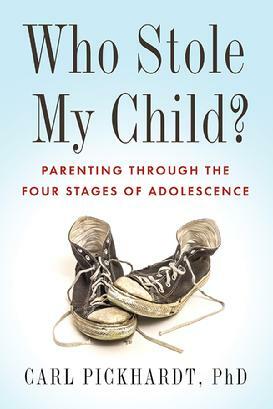 After a brief introduction to trial independence, Pickhardt carefully guides readers and parents through 11 specific challenges — including broken relationships, roommate problems, substance use, and stress — that will potentially cause a child to boomerang home for recovery. Each chapter is devoted to a specific challenge and concludes with a “parenting prescription,” or a brief outline summarizing specific actions to take and topics to discuss with adolescents when particular situations arise. In this book, Pickhardt sheds new light on adolescent development and the importance of cultivating a corresponding parenting style. Drawing on his experiences counseling both parents and children, he is able to provide thorough, effective, and realistic solutions to common problems, allowing parents to gain a new understanding of how to properly support their children while still respecting their developing freedom. By addressing both causes and solutions for the boomerang phenomenon, Pickhardt provides insight with a dual purpose, making Boomerang Kids not only a guideline for intervention, but also a prescription for prevention. 1) KEYS TO SUCCESSFUL STEP-FATHERING (BARRON'S, 2010, Second edition). Order from Amazon or other Internet booksellers. To get to enjoy right away." Order from Amazon or other Internet book sellers. WHY GOOD KIDS ACT CRUEL: The Hidden Truth about the Pre-Teen Years (Sourcebooks, 2010) Received an Honors Award in the 2010 National Parenting Publications Awards (NAPPA) Parenting Resources Competition. Order from Amazon or other Internet booksellers. August 10, 2010 lead story for the WALL STREET JOURNAL, "The Only Child." If motherhood is the second-oldest profession, then childhood cruelty might just be the third. Very few of us would want to relive the fractious minefield of our early teen years, when the most innocuous interactions take on Olympic proportions of hurt and misunderstanding. 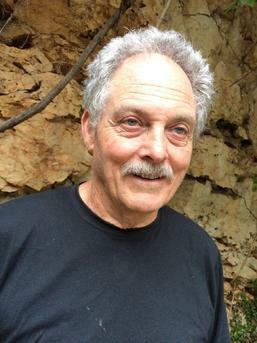 Psychologist and prolific author Pickhardt (The Future of Your Only Child) will be familiar to many readers for his other books and his weekly blog. In this latest offering, he explains why social cruelty occurs in early adolescence, what motivates this behavior, and what tactics are typically used. Identifying the five types of mistreatment as teasing, exclusion, bullying, rumoring, and ganging up, Pickhardt analyzes the psychology of the behavior, ending each chapter with advice on what parents and educators can do. Heavy on the victim end, light on the perp, this is an honest and valuable book for parents. Ideally, you read it prior to middle school, when the coyotes begin congregating at the barn. To read US News & World Report article, "Six ways parents can help kids cope with social cruelty," click below. To see TV ONTARIO Interview show about "The Future of Your Only Child,"
--"Dads and Staying Connected to their Teens."